The Azienda Agricola Rinaldi Alessandro was born in the heart of Carpi in the province of Modena and since 1984 it has handed down the experience of the family, producing the Emilian condiment par excellence. Surrounded by quality vineyards, from which an excellent Trebbiano of Modena is obtained, the vinegar farm is entirely run by the family that follows the entire production line, taking care of and ensuring the quality of the product itself. The passion, dedication and respect for tradition enhance the perfect balance between sweetness and density, all thanks to long ageing in selected barrels made of different types of wood such as Mulberry, Acacia, Ash and Oak. 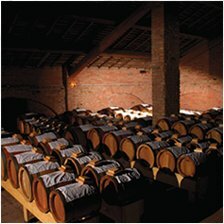 And it is exactly thanks to the patient resting period in the barrels that The Balsamic acquires the fragrances and aromas that make it unique and inimitable. All of the farm’s products leave a pleasant taste in the mouth, obtained with ancient and traditional methods and only the patience and experience handed down through the generations make Rinaldi balsamic vinegar a top quality product.